This is a list of the games I played and bought at SPIEL'13. For us, SPIEL starts long before SPIEL, as we start collecting information about the games that will be there. If a game seems interesting, we try to find the rules online and read them to see if it is something we would like. Shortly before SPIEL, I printed out the hall plans and our lists, and prepared my Essen ranking tracker geeklist. Then, it was finally time to leave. We got up early, and a bike ride, three train rides and a hike later, we were in the Messe halls. 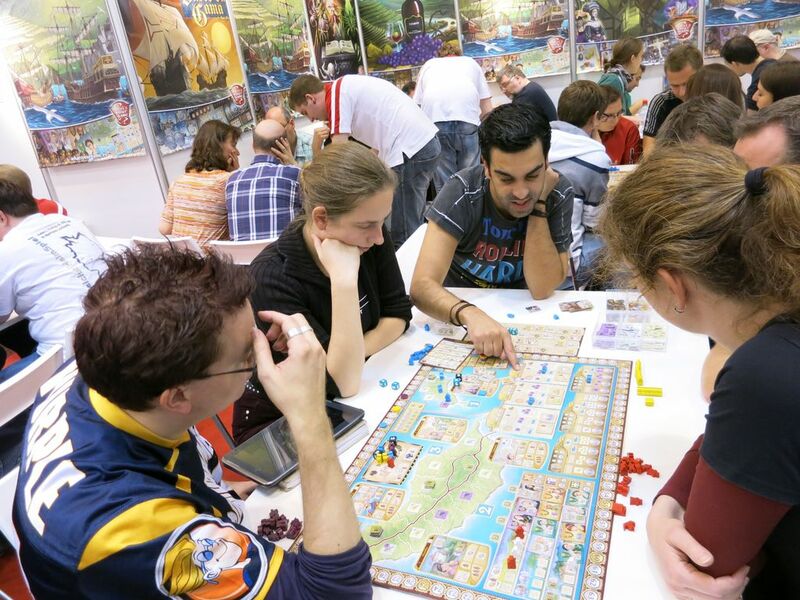 Marieke had an appointment to make a trade on thursday morning (part of the Essen SPIEL 2013 no shipping math trade). So, we did not have much time for a game, so we decided to make some pick-ups for me first, then do the trade, and then go after our first game. The first pick-up was this expansion for Flash Point: Fire Rescue. As well as this other expansion for Flash Point. And another pick-up. This one went rather slow - there was quite a queue for the pick-ups, and the one guy handling the pick-ups had to divide his attention between the pick-ups and some last work setting up the stand. So, while I was waiting in line, Marieke went to make her trade. After getting my copy of Archon, I went to the Galleria, where a huge group of BGGers had formed to do the trades. After a while, Marieke emerged with her first piece of loot: a German edition of Glory to Rome. Now, it was definitely time to play a game. Marieke had read the rules for Rockwell and was curious after it, so when we noticed an empty table at the Sit Down! stand, we didn't hesistate, and sat down. 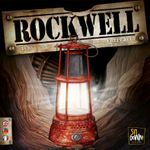 In Rockwell, each player has a mining company. During the game, you send your mining crews down into the earth to uncover valuable metals. Most of the time, the player's mining crews works together, and open up a new vein together. The profits are shared, with a bonus going to the player that triggered the new discovery. The mined metals can be exchanged for points or sold for money to buy upgrades. More points can be made by completing various achievements. We got a short explanation, enough to get us started, but without all the details. Our preference is to get all the rules in advance, so we understand the consequences of our choices in the game. Still, we went ahead, with Marieke filling in the gaps with her knowledge of the rules, and the designer popping by to answer some questions. We had several misunderstandings during the first round, so we all had a rather bad start, and I made very little progress during the first round. Marieke's SO made quite a fortune early on, but he made some investments that did not pay off, and it was Marieke who won the game. We liked the board and the general ideas behind the mining, but in the end, the unpredictable mining yields made us decide the game was not for us. The next game we had the opportunity to play was Northwest Passage, which was also on Marieke's list. She was looking for a shorter racing game, and she figured this would fill the niche. In this game, players try to move their ship through the northwest passage. At the beginning, the board is empty, and players have to place tiles on the board showing water and isles - only after that, the ship can move past. Each round, you have a number of actions available, which you can use to draw tiles, place tiles, move the ship or make discoveries. You can also use a sled, which means you'll have less actions for the ship. At some point, you'll need it, though, as a large part of the board gets frozen over, and the sled is the only way to make progress. It turned out that Northwest Passage is not really a racing game, as it is a valid strategy to just hang back and explore. I liked the freezing mechanism and the division of the actions between the ship and the sled. But there was a strange stand-off whenever two people where together: if you placed a tile, the other player would get to move their first, and be ahead in the race, or be the first one to claim the discovery. It was fun enough to play, but it was not what any of us were looking for, so we left it in Essen. 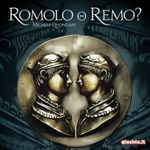 Next, we arrived at the stand of giochix.it, where there was an opportunity to try Romolo o Remo. This was on my list. I had read the rules, and the logistics part of it seemed fun, but I had my doubts if I would enjoy the military part. In the game, you try to build up your capital city, to claim the land around it. To do so, you have workers which can harvest, build, trade and recruit. The amount of actions you have is rather limited, though, as is the action radius of the workers. They need to stay close to a farm (unless you pay food to keep them fed). If they want to harvest, they also need to be near a warehouse to store their harvest. Later on, you can upgrade workers to soldiers and drive away other player's workers to increase your claim on the area. As before, we got an explanation that included only half of the rules, and were then encouraged to start. We did so, and played a couple for rounds until the fair was closing. I still had not seen the military part of the game, but I had enjoyed the game enough to buy a copy, and so did Marieke. We will have to see if the game still is fun when the soldiers start marching forth. Nations was both on Marieke's and my list to buy. We figured we'd pick-up a copy now, to avoid missing out on an English edition, and to avoid having to carry it around on a later day. The first batch of English edition games had already run out at the Asmodée stand, but we found some at the stand of a German games shop, and bought them there. At the hotel, we had some time for a short game, so we played Plato 3000, which I had brought with me for this purpose. It actually took a lot longer than planned - we needed quite a lot of rounds before somebody finally reached 100 points. Each turn, all players simultaneously select a card that allows them to build something, or to 'scheme', which will often give you points or money directly. Then, they pass their hand of cards to the player to their left - so you have some idea of what they can do next turn. I had read the rules beforehand, and I really wanted to like this game, as I like the Tempest game world. Luckily, the game did not dissappoint, and both Marieke and I bought a copy. The next game was Francis Drake. During the game, you outfit a ship for an expedition to the Spanish Main, where you will attack treasure fleets, forts and villages. Outfitting the ship is done by means of a worker placement game, but with a twist: the action spaces are arranged in a one-way street. When you select an action, your next action must be further down the street. After the ships have been outfitted, each player plans his travels, trying to reach important destinations before the others, as only the first players to arrive (and succeed at whatever needs to be done at that destination) actually get anything. I had read the rules before SPIEL, and I was sure I'd enjoy this game - I had planned to buy it without trying it. But there was an empty table, so we tried out a single voyage. (The full game consists of three voyages.) It was okay, but not great. The biggest letdown was the realisation that very little of the first travel carries over to the next one, so there is not strategy to connect the three travels. So, against my expectations, I ended up not buying this one. So - Agricola, again. We all like Agricola, and it has been played a lot. But we don't need the same game twice. So is Caverna different enough? Luckily, we had a chance to find out. In Caverna, you do not only have a farm, you also have a mine. Here, you gather iron, which you can use to forge weapons. Using these weapons, your dwarves can go on expeditions, which will gain you various goods. Also, there are no improvement cards or profession cards, but a large array of rooms for your house, which are available to every player (until someone builds it). It turned out that the pace of Caverna is vastly different from Agricola. The burden of collecting enough food is far less, leaving more space to build up an engine. So, Caverna felt as if it was moving faster. I felt that Caverna might be more interesting to casual gamers, because of the reduced pressure, but the others rightfully pointed out that they might get overwhelmed by the amount of options. I do worry a bit that the player's won't get in each other's way enough, as there are so many different things to do. All in all, we felt the game was different enough from Agricola, and fun - so both Marieke and I bought a copy. 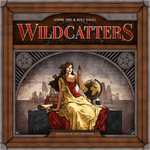 Wildcatters was another game of which I had read the rules - it seemed interesting, but I simply wasn't sure. It could turn out to be very entertaining, or a total dud. In the game, you pump up oil, transport it to refineries, and deliver it to the continent. You can use other player's transports (trains and tankers) to move you oil, but you'll have to pay them in shares of your company when you do so. If you deliver oil to another players refinery, they'll have to pay you shares, but they get shares when the refinery delivers to a continent. It still counts as your oil being delivered, which matters - at the end, each continent awards points to the player who has supplied the most oil. Points are also gained for the majority in shares in the different companies. We played two rounds (a full game would last eight rounds). I found that the mechanism where you pay others in shares was very interesting. Since I haven't finished the game, I haven't yet got a feel of how the scoring will work out in the end. Still, I bought the game. It will be some time before I've fully understood this one. If it turns out to be less good than I expect, I'll still have a lot of fun figuring that out. Marieke had read the rules for Conjurers, and it was high on her list of games to try out. 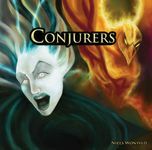 Conjurers is a worker placement game combined with a monster fighting game. You start with two workers and three monsters. The workers collect resources, which they can make into equipment for your monsters, and they can trigger battles. When you trigger a battle, you fight with your monsters in a small mini-game, which is mostly based on dice rolls and rock-paper-scissors abilities. If you win, you can add the defeated monster to your collection, building up your power. Unfortunately, the game didn't feel quite finished yet. The design could have been better - a lot of information that we would expect to see on the board and on the cards instead had to be looked up from the rules. The combat mini-game introduced a lot of downtime for the players that did not participate. The designers where aware of that, and it was encouraged to do two battles simultaneously whenever possible - but that was simply not always the case. Also, winning a battle and gaining a monster was a huge boost. As a result, it felt that losing a battle placed you far, far behind the players that did win their battle, with little chance to catch up. Vera and her SO hadn't arrived yet when we tried Canalis in the morning, and she was looking for some shorter games, as they had too few of those in their games collection. So, after dinner, we introduced them to Canalis. It was a succes with Vera too, so she also got a copy later on. On Saterday, the first free table we managed to get was City Council, another game that Marieke wanted to try out. In City Council, players vote together on which buildings they want to build in their city. Each building has different effects, and each player has goals he wants to achieve for the city. So, you'll have to make proposals that will help you reach your goals, but that won't be completely incompatible with other player's hidden agendas, otherwise they will never get through. 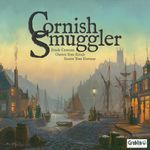 The game is quite different from the other games in our collections, and all of us had simply enjoyed the game, so both Marieke and I decided to buy it. Madeira had been on my SPIEL'12 list, and was on my SPIEL'13 list as well. 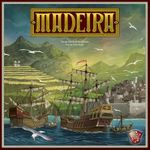 In this game, about the Portuguese colony Madeira, you once again have to collect resources, and use them to expand your empire, gain favours and feed your workers. You'll also get missions, which could mean you want to gain as many favours as possible, build a big fleet or gain a big presence in one of the cities. An important catch is that many of your actions are linked together, in random combinations that change each turn. So, the character that allows you to move ships may be combined with the building that gives you bread. That was a bit that had me worried: it could be an interesting challenge, or it could simply be a luck factor: if you wanted both ships and bread, you are happy, while other players that need food but don't want ships are worse off. The game was explained to use by one of the designers, Nuno Sentieiro. He gave us a full rundown of the rules, including all details, before making us start the game - just as we prefer it. The game worked well for us. My worries seemed unfounded - there are many ways that you can get what you need. The random setup each round can help or hinder you a bit, but not as much as I feared. After three rounds (out of five), we were convinced that we wanted to buy the game, and we broke off the session. Marieke, Vera and I each bought a copy of the game. 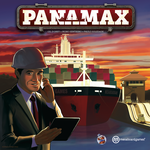 While wandering the halls looking for the next game, we came across Panamax, which was on my list to view. No rules were available for this one, but it had still caught my attention. In this game, players load goods on the ships that go through the Panama Canal. When the ships get through, they gain money for the containers that have been delivered. The money is needed to pay maintenance for goods that have not yet been delivered, and can be invested in bonds, whose values change based on the goods that are delivered. At the end of the game, the player with the most money wins the game. Gil had warned us that Panamax was a bit lighter than Madeira - and it was. (The board suggests it is actually a bit heavier.) We really enjoyed the game. I do wonder if there are enough different strategies to keep the game fresh, but I'll certainly consider buying it when it gets out. Panamax is a four player game, so Vera didn't join in, and instead went to browse the fantasy/LARP stands. I asked her to pick up a copy of this Tokaido expansion for me. I got Tokaido last year, and really enjoy it, but it is a bit simple, and I am hoping the expansion adds some more choices. After Panamax was finished, we decided to do a bit more shopping - on Sunday, some publishers will already leave, and some things will have been sold out. Also, it was difficult to find a new game, so this was a good time to do it. 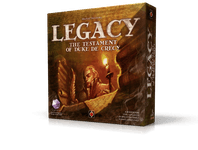 The first thing I wanted to pick-up was Legacy. I really liked the theme (and mechanism) of the family tree (in fact, it is uncomfortably close to a game idea I've been entertaining myself for some years now). Based on the rules, I decided to just get this game. 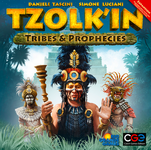 Tzolk'in is rather popular at the games club, and I figured many people there would enjoy the expansion. So, when Vera wanted to visit the CGE stand to pick up a copy, I bought a copy for the club as well. I had two more kickstarters to pick up. Gear & Piston was the first. A few metres further, there was Minion Games, where I was supposed to pick up Hegemonic. However, various bonus parts were not available, as was the special Kickstarter edition. Not a big deal, but I had plenty of new games, so I decided to go with the option of having the special edition shipped to me. So, no Hegemonic for me yet. Hopefully, it will arrive soon.